In the universe of The Vampire Diaries, vampires can eat cheese along with other normal human foodstuffs. Which is a good thing, since The Vampire Diaries is the most awesomely cheesy television program we've seen in years. It's can't-miss television. Spoilers for season one of Vampire Diaries below. When The Vampire Diaries started a year ago, we pretty much wrote it off as a silly, unworthy spawn of the Twilight craze. (Although it's based on a longstanding book series by L.J. Smith.) But we were so wrong. We've watched the whole first season, which is now out on DVD, and it's way better and more fun than we'd realized. It is definitely extremely silly, but as you'd expect from a show by Scream's Kevin Williamson (and Kyle XY's Julie Plec), it's actually pretty clever and self-mocking at times — and when it does descend into mopey emo medleys about the characters feeling their feelings, it's still pretty hilarious. Most of all, this show is crack. You can watch five episodes in a row and just sit there screaming at the television — then decide that three o'clock in the morning is not too late to watch one more episode. What's the show about? Here's a quick primer. Stefan has been in hiding for a hundred years, but then he sees Elena (Nina Dobrev), who's the spitting image of Katherine, the evil vampire who turned Stefan and his brother Damon into vampires back in 1864. Stefan stalks Elena for a while, to make sure that she's not evil like his ex, then he starts going to her high school and putting his smoove moves on her. Eventually, she finds out he's a vampire, and gets into the now-traditional "vampire's girlfriend" role, although in later episodes she actually starts to fight for herself instead of just being a damsel in distress. And then we learn that Katherine, her vampire doppelganger, is still on the scene as well. But soon enough, Stefan's eeeeeevil brother Damon reappears, played by Lost's Ian Somerhalder. For the first bunch of episodes of the show, Damon just goes around killing everybody he meets, until he finally runs out of steam. For some reason, we're not supposed to root for Damon to get staked, even though he's clearly a murdering psycho, because he's both cute and campy. He's like this show's answer to Spike, sort of. There are a whole bunch of scenes in season one where someone is finally about to kill Damon, and Elena talks them out of it, because she not-so-secretly has the hots for him. So basically, everybody Damon kills is Elena's fault. Most notably, Damon kills a witch/bartender played by Gina Torres, in one episode — thus ensuring that we'll never see a spin-off show about Gina Torres as a bartender who's not-so-secretly a witch and occasional vampire hunter. Why does television hate us? Sorry, killing Gina Torres puts you beyond the pale in my book. On the other hand, Damon is the most entertaining thing about the show, and his antics just get sillier and more obnoxiously awesome as the show goes on. Plus he sort of becomes the lesser of two evils, as a whole slew of even nastier vampires start descending on the tiny town of Mystic Falls — which seems to have a population of a few hundred and somehow survives losing a good ten percent of its population thanks to vampire slaughter. There's a whole host of other characters including Bonnie (Katerina Graham) who's a budding witch, Caroline, who's the shallow party girl with — wait for it — hidden depths, Elena's angsty brother Jeremy, and Alaric Saltzmann, a history teacher who's also a vampire hunter. Because. But honestly, all you need to do to roll with this show is know that there are two hot vampire brothers, and one is broody while the other one is smirky, and they both like Elena, who's got her own evil vampire doppelganger. Easy, right? Your life is pathetic. Your after-life doesn't have to be. [Reading Twilight] What's so special about this Bella girl? Edward's so whipped! Occasionally, with its teen character, the show is clearly trying to be Whedonesque, and there have been a few little Buffy shoutouts here and there, I think. The main thing is, like Muppet Angel, this show is fluffy and sarcastic and you want to watch it for hours. 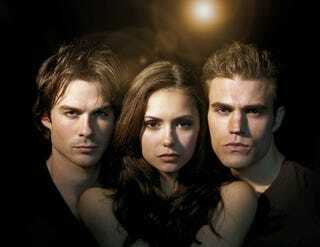 The good news is, a new season of The Vampire Diaries starting tonight at 8 PM on The CW.